Now Available: More Deadlands Small-Scale Combat Supports and Savage Worlds Shirts! Just in case you didn’t get enough new stuff in last weeks Deadlands extravaganza, we’ve got even more new stuff for you this week! The first in our new series of print-and-play tile maps, Deadlands Temple of the Sun, is now available. Next time you find your cowpokes smack in the middle of an ancient civilization’s high holy ground, just run this handy PDF on your color printer, trim, and let the carnage commence. Even if you’re not in the Deadlands setting, why let your grand ancient temple needs go unmet? Pick up the Temple of the Sun today! We’ve got two new pals for you to play with, too! Say hello to muckraker extraordinaire Lacy O’Malley and dangerous man of mystery Old Pete. They’re both swirling in secrets—some of which you might even want to know! They’re the latest two addition to our full range of Deadlands miniatures by Reaper. Be sure to check ’em out if you’ve not had the chance. While you might not want the shirt off our back (it’s been a hot summer, you know), I’m sure you’re going to want one of our new shirts on your back! Three new shirts—the Savage Worlds T-Shirt, the Savage Worlds Ringer T, and the Savage Worlds Bowling Shirt—join our full line of Savage Worlds shirts! As charming and debonair as I know you must be (since you’re a fan of Savage Worlds, after all), one of our shirts can’t help but make you even more handsome. Impress your friends and neighbors and buy one today. Add a “Little” to Your Low Life with Low Life Miniatures! That’s absolutely right, by popular demand and the screaming insistence of literally gazillions of clamoring fans, Mutha Oith Creations, in partnership with the formidable Eastern Front Studios, is proud to announce an entire line of high quality (wait for it)…miniatures for Andy Hopp’s fantastic Low Life setting for Savage Worlds! You can get in on the action right now—if you don’t delay! 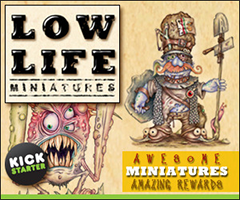 The Low Life Miniatures Kickstarter campaign wraps up Sunday, September 23! Dozens of miniatures are being rewarded through this Kickstarter, including several incredible limited editions! Some of the industry’s most celebrated sculptors—including Jason Wiebe and Alessio Cisbani—are working with Mutha Oith Creations and Eastern Front Studios to bring you some amazing minis unlike any you’ve seen before! Nab them all! Exclamation point! Take your Savage Worlds experience to new digital heights with Serf Productions’ planned cloud-based digital suite. Put your everything you need for character creation and tracking your character during play in the palm of your hand (or expanse of your tablet). Serf Productions is going with a shorter Kickstarter campaign, ending October 6. Don’t miss out. You might even want to use that smart phone you’ve probably got to set yourself a reminder to check out the Savage Outfitter Kickstarter page soon! After all, not only can they explain their product better than I can, they can do it with a video! 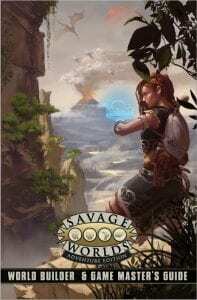 Savage Mojo is bringing you two things today—the chance to join in their new Kickstarter product and the chance to pick up their latest creation! First up is Savage Mojo’s Kickstarter for an old-school killer dungeon set in their fantasy realm, First Age of Relic. Dungeonlands: Tomb of the Lich Queen takes your band of heroes deep into a labyrinth designed to keep them from their goal—freeing the angel that is trapped within. 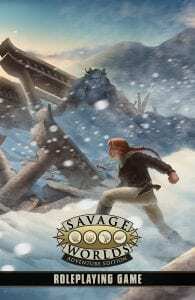 It’s a combination of the epic adventure from Savage Suzerain with classics from the foundations of gaming. With an all-star production cast and a variety of accessories and pledge rewards, the Tomb of the Lich Queen Kickstarter campaign is one you’ll definitely want to check out soon! If you want something you can get your hands on right now, Heroes & Servitors is more up your dank dungeon corridor! Heroes & Servitors is a book of pregenerated characters written in the high fantasy and epic conflict style of Tomb of the Lich Queen. Each character is completely generated and ready to play, including a backstory, an evil twisted version of the character, and a premade fiendish dungeon encounter made especially for them! However you mix ’em up, it’s going to be lively! Heroes & Servitors was designed in a 24-hour period as the result of a Savage Mojo Design Party. It’s for use with Savage Worlds and Savage Suzerain, and is completely ready to go with the Tomb of the Lich Queen supplement. Last Few Hours for the Raven Graphic Novel Kickstarter! Woo-hoo! You did it! Visionary Comic’s Raven Graphic Novel Kickstarter is now fully funded and has already hit its first stretch goal. What goal is that? For every extra $1,000, they’ll add another five pages to the book. Keep hitting that $1,000 button, and they’ll add extra books! Be sure to check out the remaining perks available for high contributors, too. Don’t miss your chance—the Raven Graphic Novel Kickstarter is down to only hours remaining! This is your chance to get in on the ground floor of the Reckoning! It’s a Deadlands Extravaganza—with Dice! Have you been pinin’ away for new Deadlands material? We figured you were, so here you go! If the Weird West was built by hard work, I guess it’s time your posse got ’em some calluses. 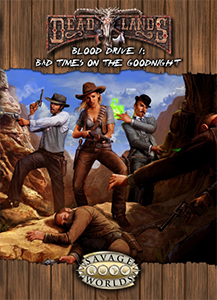 Blood Drive 1: Bad Times on the Goodnight puts your heroes on one of the longest, most danger-fraught cattle drives in the Weird West—spanning two countries, a war-torn no man’s land, and the Sioux Nations! Along the way, they’ll cross paths with virtually every major railroad, bloodthirsty border raiders, Indian war parties, and of course, nightmares of the sort found only in a land ravaged by the horrors of the Reckoning. Bad Times on the Goodnight is the first installment in the Blood Drive series. The Blood Drive series is a complete campaign. Each adventure starts and ends in such a fashion that if you want to use it by itself without the others in the series, you can easily do so. In fact, they’re perfect for getting a posse from one part of the Weird West to another if that’s what you’re looking for, Marshal. Used together, the three combine to take the heroes from greenhorn cowpunchers to hardened trail hands fighting for their cattle, their land, and even their lives! If something so big ain’t for you, hombre, how about somethin’ smaller, like a whole new crop of Reaper Deadlands Minis? Whether you’re looking for a Wichita Witch, Red Petals Su, the Warlord Kang, Baron Simone LaCroix, or something cuddlier like a Bone Fiend, it looks like the general store is now stockin’ for you! Still not enough for you? Surely you’re a bettin’ man, then, up for a game o’ chance, right? Then we’ve got you set with a restock of the Deadlands Dice and the Savage Worlds Wild Dice! Rattle those bones with a little clatter customized for your Weird West or Savage Worlds adventures—let the good times roll again, eh, partner? Mission Gamma—part 3 of a Mercenary Breed campaign set within the Hastilion Expanse. Nation Guide: Anglo-Saxon—a gazetteer detailing the Anglo-Saxon nation for Faith & Demons: The Rising with new source material, character options, and bestiary. Of Orchids and Oaths—a modern fantasy horror adventure for Judgment Day. Random Encounters: The Ossuary—a fantasy horror adventure including battlemap. Surveyed: Lord Bane-a mini-sourcebook for Faith & Demons: The Rising detailing the domain of Lord Bane. Tavern Tales—a continuation of life at inns and taverns for fantasy games. Ultimate Mass Battle Guide, Part II—part 2 of our alternate mechanics series bringing new options for running a mass battle. 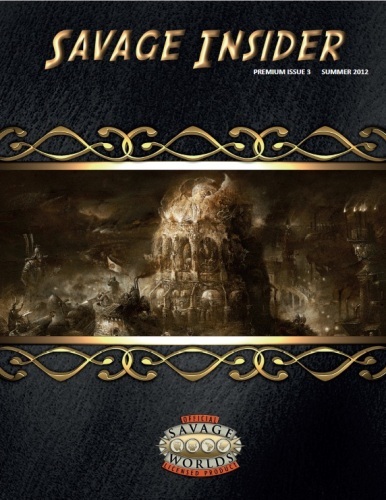 Look for new issues of Savage Insider Premium every quarter between releases of the free Savage Insider standard issues. Hungarian Test Drive Rules Now Available! * I had to trust Google for that. I hope they’re right. 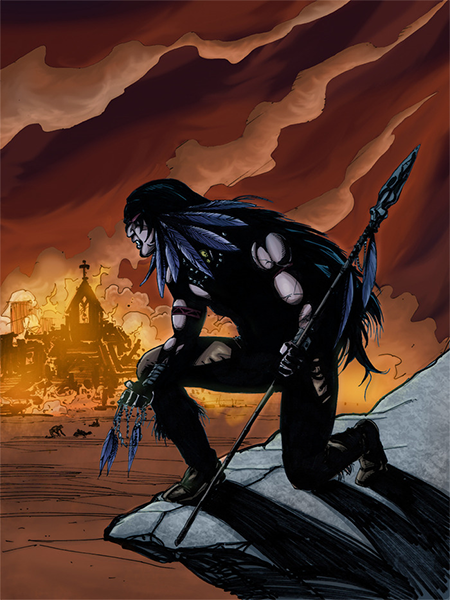 Raven Graphic Novel Kickstarter in the Home Stretch! Original Deadlands Classic artwork! We don’t mean a copy of anything—we’re talking the actual originals hand-made by the artists straight from our historic vaults of rare and special things! You in the story! Seriously, how many of your friends could possibly say they’ve been killed by a Servitor of War hell-bent on wide-scale revenge on immigrants? Visionary staff working for you! That’s right, you can get the expertise available only from Visionary applied to your very own projects if you play your cards right. There’s too many more to summarize, so be sure to take a gander at the Kickstarter campaign for yourself! If you’ve been meaning to join in, now’s the time before it’s too late. With less than ten days left now, you don’t want to miss your chance! If you missed them at Gen Con, you can still catch Visionary at Baltimore Comic-Con September 8-9. You can even commit to the Kickstarter campaign on site! Everyone making pre-orders at conventions gets a special on-site thank you! 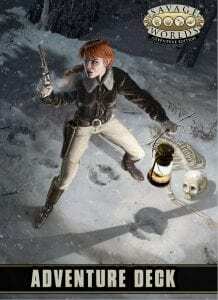 They’ll also have the Dead Man’s Hand trade paperback collecting their first one-shots, all new gaming content, and a new short story from Matthew Cutter! They’ll also have Deadlands prints for sale, and will be happy to sign (pretty much) anything you like. The entire creative team will be on site at Baltimore, and artist Greg LaRoque will be sketching and taking commissions! Have you ever found yourself in need of a general form-fillable character sheet for a Savage Worlds super powers game? Well, worry no more. 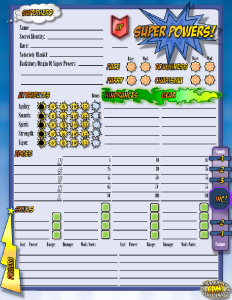 Savage fan Michael Ysker’s form-fillable super powers character sheet is now hosted on our web site. If you haven’t already, be sure to take a look at our free downloads, ready for the electronic picking!